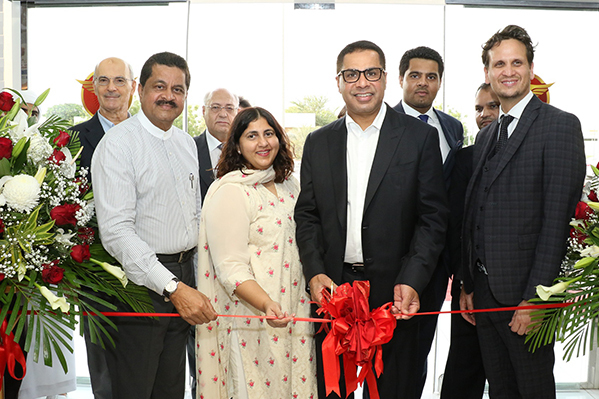 The biggest and most advanced hospital for physical therapy and rehabilitation opened at Thumbay Medicity, Al Jurf, Ajman on 4th July 2018. 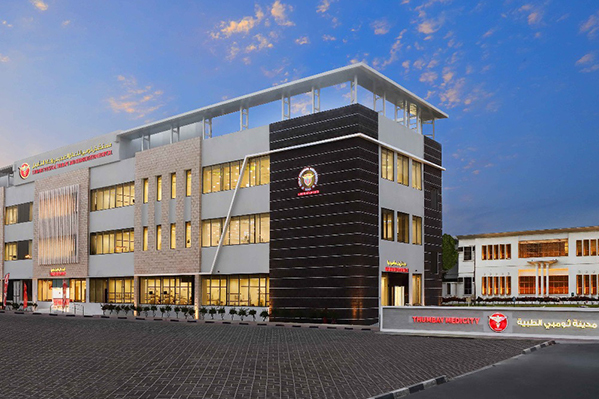 Operating under the healthcare division of Thumbay Group, the Thumbay Physical Therapy and Rehabilitation Hospital (TPTRH) is a teaching hospital and an Academic Health Centre under the Gulf Medical University Academic Health System (GMUAHS). Mr. K. E. Faizal, Founder & Chairman of KEF Holdings was the chief guest of the opening ceremony, presided over by Dr. Thumbay Moideen, Founder President of Thumbay Group, in the presence of Mr. Akbar Moideen Thumbay, Vice President of the Healthcare Division of Thumbay Group and other members of Thumbay Group Board. As the most cutting-edge physical therapy and rehabilitation facility in the region, TPTRH seeks to redefine the standards of physical rehabilitation by introducing innovation in the form of state-of-the-art technology, futuristic facilities, cutting-edge research and advanced learning. Innovation is one of the key features of the hospital. State-of-the-art rehabilitation treatment is delivered through advanced technology like virtual reality. The hospital operates in collaboration with internationally renowned Villa Beretta Rehabilitation Center, Department of Rehabilitation Medicine, Valduce Hospital, Italy. It is attached to Thumbay University Hospital Complex, having 50 dedicated beds specially for rehab and Therapeutic Garden in the upcoming Thumbay University Hospital. The outpatient department of the hospital offers neurocognitive rehabilitation to help brain-injured or cognitively impaired individuals to regain normal functioning. Sports medicine is yet another important area, and the hospital is fully-equipped for the diagnosis, treatment and management of sports injuries and musculoskeletal disorders in national and international level sportspersons and athletes. Orthopedic medicine is also available at the hospital, for the prevention and correction of fractures, deformities, disorders, injuries and diseases of the bones, muscles, ligaments, tendons and related tissues. Spread over three floors, the hospital features cutting-edge amenities for physical therapy, such as Hydrotherapy Pool, Robotics and a unique Cryotherapy Chamber. One of the most remarkable components of the inpatient facilities at the hospital is its ‘Therapeutic Garden’, an innovative approach to rehabilitation intended to give patients a positive experience during their recovery. The Therapeutic Garden will improve the patients’ balance, walking, and other life skills, helping them recover from stress and promote health. The hospital also has two gyms for the convenience of patients. The doctors at the hospital are highly qualified and experienced, and the staffs are well-trained and skilled to providing outstanding care. The hospital focuses on addressing the needs of individual patients through customized treatment programs, to maximize functional independence and facilitate recovery. The upcoming Thumbay academic hospital at Thumbay Medicity would also serve as an extension of the rehab facilities at Thumbay Physical Therapy and Rehabilitation Hospital. 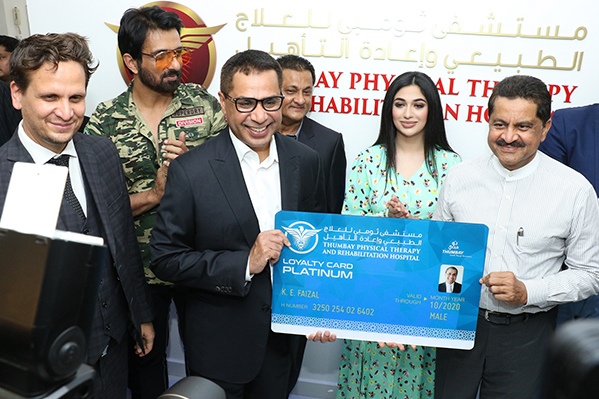 Mr. Akbar Moideen Thumbay, Vice President of the Healthcare Division of Thumbay Group said that Thumbay Physical Therapy and Rehabilitation Hospital aimed to enhance patients’ quality of life. “The primary aim of the hospital is to deliver clinical and customer service excellence to patients, at affordable costs, helping patients achieve their maximum levels of function. As a teaching hospital, it also seeks to promote excellence and innovation in clinical service, teaching and research,” he said. The hospital also has the Marhaba Lounge for personalized services to patients by fast-tracking registration formalities, consultation, examination/diagnosis, procedures, documentation, billing etc. Mr. Akbar further said that TPTRH is in line with the ‘National Strategy For Empowering People with Disabilities’ launched last year by His Highness Sheikh Mohammed bin Rashid Al Maktoum, Vice President and Prime Minister of the UAE and Ruler of Dubai. “The strategy announced by His Highness aims at creating an inclusive society for those with special needs and their families. The six-part policy involves health and rehabilitation, education, employment, mobility, social protection and family empowerment, and public life and sports, which are the focus areas of TPTRH,” he explained. Thumbay Medicity, in Al Jurf, Ajman also houses the region’s leading private medical university – the Gulf Medical University as well as the first private dental hospital in the country and the largest academic dental hospital in the Middle East region’s private sector, Thumbay Dental Hospital. A 500-bed academic hospital – the largest private academic hospital in the region – is at the final stages of completion at Thumbay Medicity, slated to open shortly. Thumbay Medicity also houses Body & Soul Health Club and Spa, The Terrace Restaurant, Blends & Brews Coffee Shoppe etc. According to Dr. Thumbay Moideen, the Founder President of Thumbay Group, the ongoing and upcoming projects at various locations in the UAE as well as elsewhere in the GCC, Africa and India are in accordance with the group’s strategic plans, which will scale up the size of the businesses at least ten times establishing global presence and increasing the employee strength to over 25,000, in the next 4-5 years. “The Thumbay academic hospital network will have a total of 1000 beds in the UAE, 1500 beds in India and 750 beds elsewhere in the Gulf and Africa by 2022, in addition to upcoming clinics, day care hospitals, labs and pharmacies at various locations,” he said, outlining the strategic plans for the healthcare division. Various soon-to-open clinics and pharmacies under Thumbay Group’s Healthcare Division are at different stages of development in locations in the UAE including Deira Waterfront, Dragon Mart and Bur Dubai in Dubai and Abu Shagara and Rahmaniya Mall in Sharjah. University and teaching hospital projects are also progressing at various countries in Africa and the GCC. The Thumbay network of academic hospitals is now the largest network of private academic hospitals in the Middle East, treating patients from around 175 nationalities. It is also one of the biggest JCI-accredited private academic hospital networks in the region. Thumbay Group’s healthcare division also operates a chain of family clinics (Thumbay Clinic) and multispecialty day care hospitals (Thumbay Hospital Day Care) in the UAE as well as diagnostic labs (Thumbay Labs) and pharmacies (Thumbay Pharmacy) in the UAE and India. The hospitals and clinics are presently located at Dubai, Ajman, Sharjah, Fujairah, Ras Al Khaimah and Umm Al Quwain in the U.A.E. and in Hyderabad—India. Thumbay Medical Tourism, which promotes Thumbay Group’s ultra-modern healthcare services to international patients, is tied-up with 87 countries through representative offices.